It’s one of the paramount fears of childhood that we will lose our parents one day. If you don’t believe me, just watch Bambi again. Heck, watch any of the Disney movies. It’s not just wide-eyed forest creatures wandering aimlessly about the meadow motherless… all of those Disney Princesses’ mothers are conspicuously absent. Thanks Walt. It’s small wonder we were petrified as children that our mothers would pass away, leaving us to face the world alone. But it wasn’t limited to The Wonderful World of Disney. What about all those Shirley Temple movies we were weaned on? Or Little Orphan Annie? Or Oliver? They made it clear that the world is a harsh place for the motherless. It’s an actual wonder that “orphans” get out of bed in the morning. But we do. Mostly because we have kids of our own. Some of us even have grandkids. Besides, we knew all of our lives that our parents would more than likely pre-decease us. So we were prepared for this eventuality and all that it entailed, right? Yesterday was the day we converged upon our mother’s home to perform the final clean-out, as we close with the new buyers in a week or so. I was extremely worried over how my sister would handle this entire undertaking. I didn’t think she would deal with the process very well. After all, she was the “in town” kid that practically lived with Mom – caring for her these last few years. We got straight to work. All business. Brisk and efficient. We emptied cupboards and packed boxes. Meanwhile, the moving men were hard at work moving the big stuff. As the house emptied out, the walls started to produce an echo. I thought I could hear the long-ago sounds of my children and my nieces and nephews chasing one another down the hallways when they were toddlers. Eventually, the men started making progress toward my mother’s bedroom. I blocked their way. They seemed like lovely gentlmen, but I didn’t want them in my mother’s closet. Mom was a fashion icon who adored her clothes. My sister and I needed to go through her closet ourselves. Before I knew it, I had dissolved into a puddle on the closet floor. My sister cradled me for awhile. Then she slid Mom’s jade ring on my finger. She pinned a silk rose on her own shirt. She gave me some gloves and took a leopard hat. We each helped ourselves to a shiny sequined evening bag and then buried our faces in our mom’s monogrammed robe. We boxed up the rest and beckoned the movers in. A few hours later, I opened a kitchen drawer my mom called her “miscellaneous drawer.” Inside I found a pair of sunglasses, some paper clips, a picture of Mother Theresa, a refrigerator magnet that warned people not to “Mess With Texas” and a rock I had painted in the 7th grade. 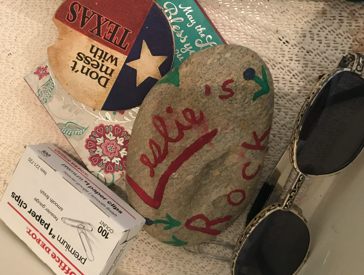 You could tell what a creative spirit I’ve obviously been throughout my entire life- because on it I had colorfully painted the words, “Leslie’s Rock.” Purely Inspired. Artistic Genius. Still…I couldn’t believe my mom saved a rock for over 40 years. Had it been in this drawer all this time I wondered. Or… maybe in the words of Paul Simon, she just loved me like a rock and that’s good enough for me. Sent from Joel’s iPhone Leslie, you are so special. I think any time you want to see your mom you should go look into a large mirror. You will see her standing next to you. Try it! Just talk to her. I think you will be amazed. Donât worry if you donât see her right away, close your eyes, she will join you. Thatâs what I do whenever I want my momâs advice and guidance. She always lets me know the right thing to do! Remember how special you truly are. After all, you made your Mom so happy, and your dad lit up every time you came into the room. And you made me a very proud Uncle. Uncle Jody – I love you so much. Always have!! Heartbreaking- and thanks for sharing it. Our own light can’t shine until our heart gets a few cracks in it.